The objective of these play constructions are to add a new level of interaction in public playgrounds for all children to enjoy. Public playgrounds are frequently designed to make children move around and stay active, but they often lack enough mental stimulation to flex the problem solving skills and abstract thoughts. This design is based on 'Connect 5' but is designed to be public playground appropriate, and contain more tactile elements that still stimulate the sensory cognitions aswell as the abstract. Places like the 'Imagination Playground' are an incredible space that expand on children's creativity and allow them to buid their ideas and thoughts. Unfortunately these spaces are privatized, and so only a limited pool of children can access it. The constructions built in this class are designed to expand the children's minds in the same ways, but still be feasible within public spaces. Currently working to launch a crowdfunding project by the Spring of 2018. Barking Concepts is a brand that was personally created and is in the early stages of development. Primary objective is to apply my current level of education into a public environment, and analyze responses from the current market. Currently, specification sheets are done, and samples are being ordered. By the end of 2017, video and product line will be ready for launch. Unlike traditional Cardholders, a gap is left in the front slot to allow a card to pass through. It allows smoother, one-handed access through turnstiles, and security check-ins. 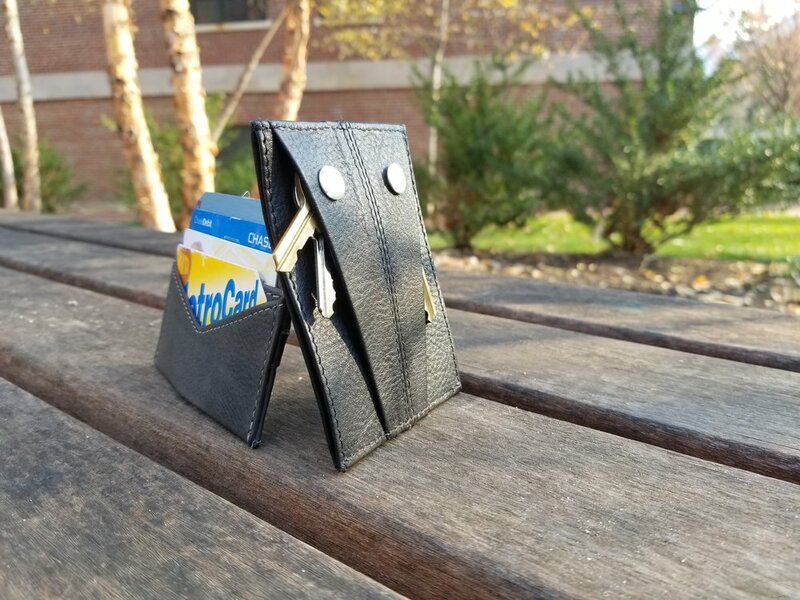 Designed to keep the keys and wallet together, and allow a more compact design for carrying around keys. Initial drafts and measurements that were sent to a factory in India to create samples.